One of the great Australian plants, Thryptomene is found in Western Australia, South Australia and in Victoria and are a hardy drought tolerant plant once established. Over 40 species have been identified with only a handful being grown commercially as garden plants or for foliage. Although the flowers are small, they do appear in masses from spring to summer almost covering the stems. Widely in the commercial cut flower industry is the Grampians Thyryptomene (Thyryptomene calycina) where it is used as ‘backing foliage’. Thyrptomene also has a place in the garden. Thryptomene baeckeacea is pictured right. A small evergreen shrub, Thyrpomene grows to about 1.5m, but with 40 or so species this will vary. Flowers appear from winter through to spring and with its graceful arching stems looks great in the garden. Flower colours vary from white through to pinks and purples, they make great garden plants as well as being a commercial crop. One outstanding white flowering variety is T. saxicola ‘Alba’, good green foliage and clean white flowers from winter through to spring. T. saxicola ‘F.C. Payne’ has pink flowers and is a fast growing cultivar. Although the majority of the species are from Western Australia, some garden worthy species are from other states. Many will grow well in other areas. All species prefer a well drained soil and are regarded as drought tolerant. Thryptomene, once established is drought tolerant. A slightly acidic soil is best, however they do tolerate a range of soil conditions. Like many native plants they do benefit from light pruning, and can be pruned simply by picking the flowers. It is not advisable to cut back into old wood as they tend not to reshoot, so simply cut the flowers while fresh and bring them indoors. T. micrantha – Small white flowers and smaller foliage than some. A species from Victoria and South Australia that can reach 1.5m in height. T. baeckeacea – This is a smaller growing species from WA, and worthy of a place in the garden as a ground cover. 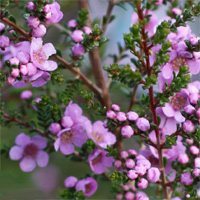 Look for ‘Pink Cascade’, attractive pink flowers on a bushy low growing spreading shrub to 50 cm in height.